FBN’s Peter Barnes with Rob Khuzami, former SEC head of enforcement, on his time at the SEC and the commission’s focus on insider trading and dark pool regulation. The outgoing enforcement chief at the Securities and Exchange Commission has a message for future Bernie Madoffs: you will be caught. 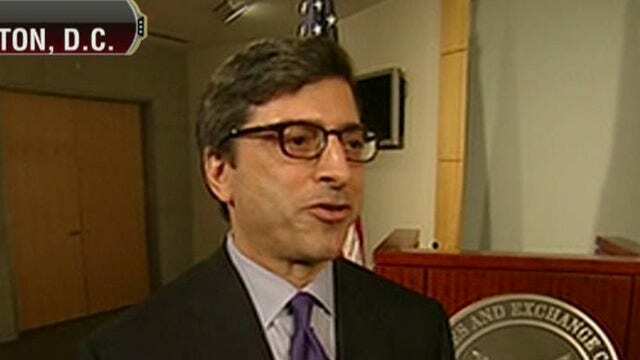 “The agency has increased its expertise, its use of data, its specialized focus and a whole bunch of new initiatives that makes us better equipped to be a market watchdog and be an effective enforcement authority,“ SEC Division of Enforcement Director Robert Khuzami said in an exclusive interview with FOX Business on Tuesday. Khuzami, 56, joined the SEC in 2009 in the wake of the financial crisis and the discovery of Bernie Madoff’s multi-billion-dollar Ponzi Scheme and is often credited with revamping the agency’s enforcement unit. In 2011, the agency reports it brought more actions against Wall Street and financial institutions at the center of the financial crisis than in any comparable four-year period. Critics, however, argue he hasn’t been tough enough on financial firms and that the agency still relies too heavily on levying fines and settling cases. In his defense, Khuzami said more than 150 individuals and entities have been charged with wrongdoing during the financial crisis. “We’ve been the most vigorous enforcement agency out there; it’s a very real record of accomplishment,” he said. He added that the agency is limited in the amount of damages it can collect in its enforcement cases and has asked Congress for expanded authority. Khuzami pointed to insider trading as another area the unit has stepped up its enforcement, claiming it has brought more than 160 cases in the last three years. He didn&apos;t say how many insider-trading cases the agency is currently investigating, but said it remains “a high priority and active area.” He declined to comment on reports on investigation into hedge fund SAC capital and its founder, Steven Cohen. High-frequency trading, which is a computer-driven form of trading, has also been a top concern for regulators following the 2010 flash crash that dropped the Dow Jones Industrial Average nearly 1,000 points in a matter of minutes, and the near implosion of Knight Capital Group, which lost a staggering $460 million on Aug.1 on a computer glitch. Khuzami said the agency is looking at a number of actors and trends in the marketplace. Khuzami, who was a former federal prosecutor and bank executive, announced his February departure in December and said he hasn’t decided on his next move.